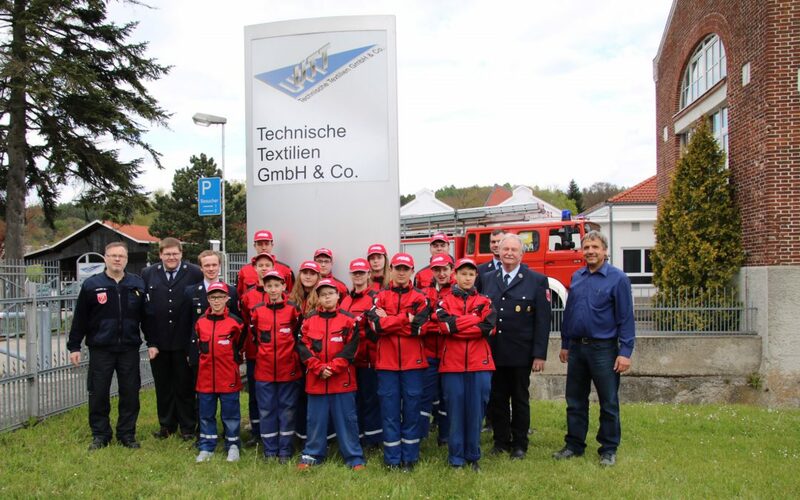 „It is fun to help!” – the motto of Krumbach‘s young firefighters who UTT Technical Textiles GmbH & Co. supported with the donation of new outfits for the youngsters. Well equipped with bright red polo shirts, sweatshirts and softshell jackets the junior firefighters have a uniform appearance. With such fantastic clothing it will be much easier to learn technical basics, fire-fighting procedures and team spirit for the future fire service and even to finish the basic training. Head of the young people’s section, Karl-Heinz Heberle, expressed his sincere thanks and thanked UTT in the name of Krumbach’s young firefighters for the great support. For many years UTT and Krumbach’s fire brigade have had a very good relationship. The manufacturer of technical textiles provides its premises regularly for training exercises which helps to train for an emergency. Difficulties are discovered and eliminated at an early stage. In the event of an accident the firefighters have the important know-how to protect the essential production area of UTT quickly and effectively. The suction points and hydrants provided by UTT on its premises contribute to the co-operation with the fire brigade. In case of an emergency UTT can rely on fast and optimum aid and readiness of Krumbach’s firefighters. The junior firefighters are tremendously important in order to secure this reliability for the future.